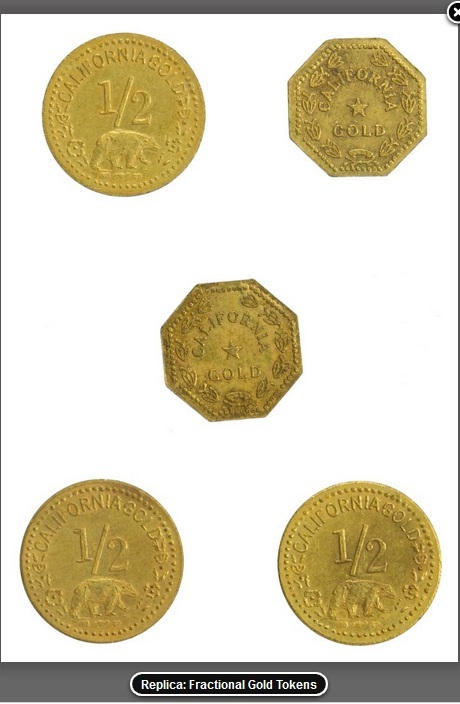 We continue our fight against fake California fractional coins, especially when they are described as 19th century gold. The above replica is not from California and not minted in 1853. Calling it a “token” without the qualifier “replica” is inaccurate. As such, this lot is a SNAD (“significantly not as described”). 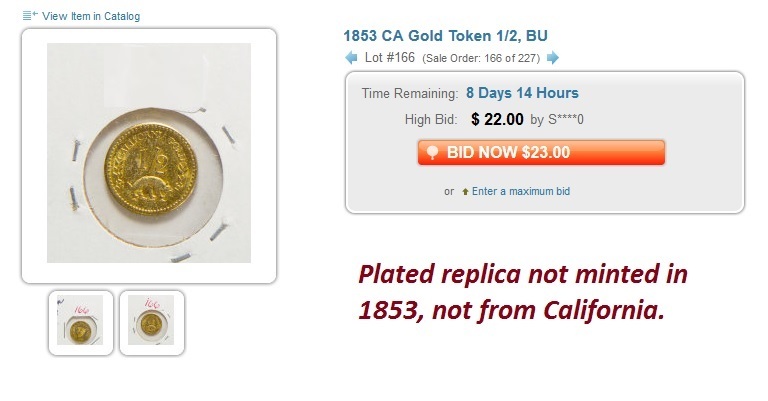 The replica above was described as “1853 CA Gold Token, 1/2, BU.” These replicas have been plaguing numismatics since the 19th century when the U.S. government began to crack down on them. California gold replicas are plentiful today, and the temptation is to offer them as authentic. When we spotted this one on Proxibid, the bid already was at $22. See photo below. That bid is about $20 more than the replica is worth. 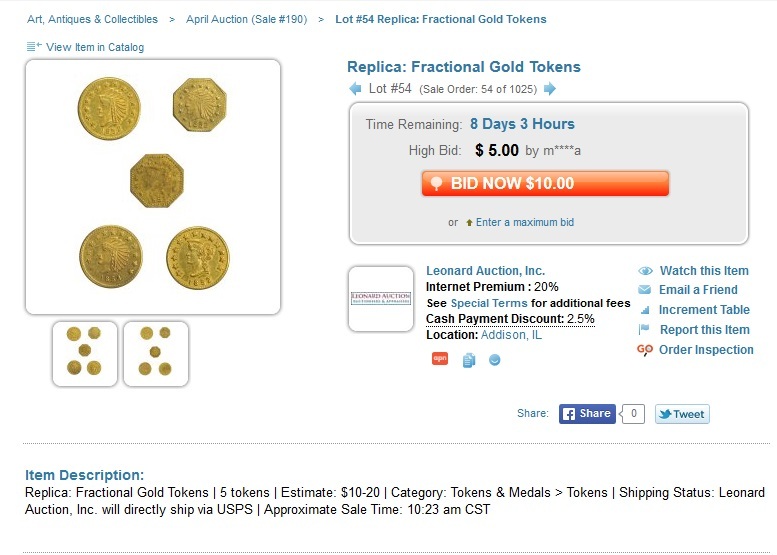 Leonard calls them replica tokens worth about $1-2 each. 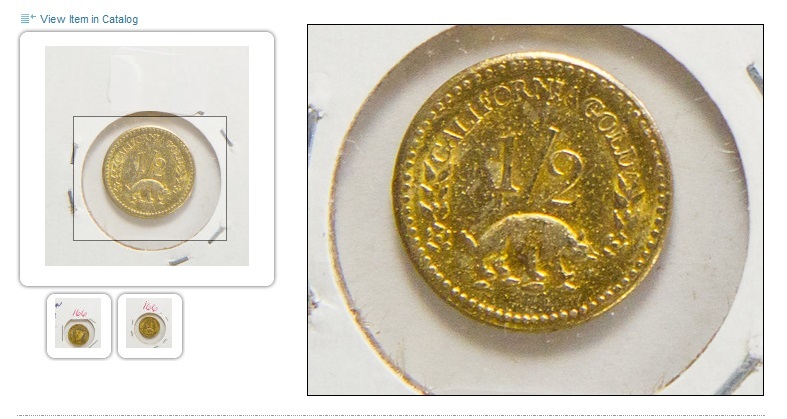 He is selling them as one lot and provides a clear photo of the reverse, showing the dreaded “bear” (which signifies a replica or counterfeit). We advise not to offer these fakes. Don’t obfuscate the matter, either, by calling them gold tokens or gold souvenirs. Using the word “gold” without testing the lot for the metal also is spurious. Most of these are brass or brass with gold plate. If you test for gold, note the karat. For more information about real, replica and fake California gold, click on the most popular Proxibid post viewed more than 1000 times since 2012. This entry was posted in News and tagged American Numismatic Association, Auctioneers, AuctionZip, Best Practices, california fake gold, Coin Auction, iCollector, Leonard Auction, National Auctioneer Association, Proxibid, Proxiblog. Bookmark the permalink.